Because I can/have to eat a lot more with this training, I am very conscious about what I put into my body. As a result, I only eat homemade foods. 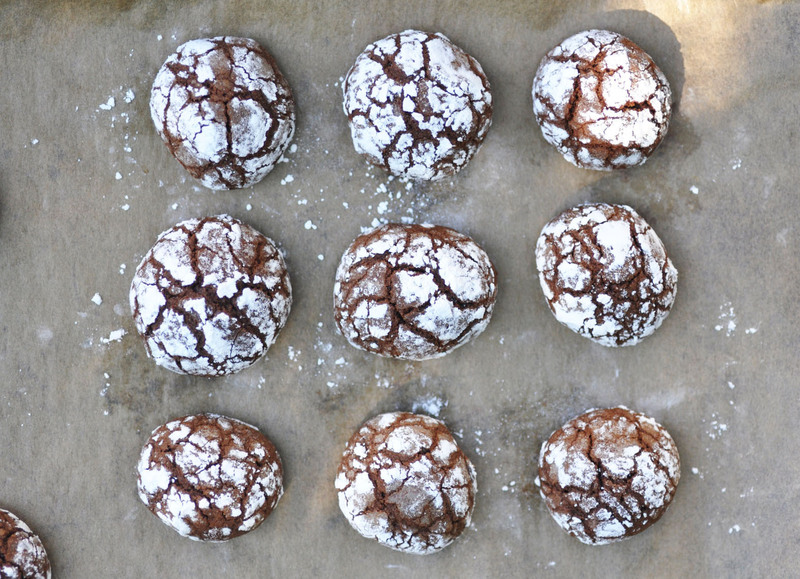 The good thing is, I never get tired of baking cookies. I love doing that first thing in the morning, or last thing at night. 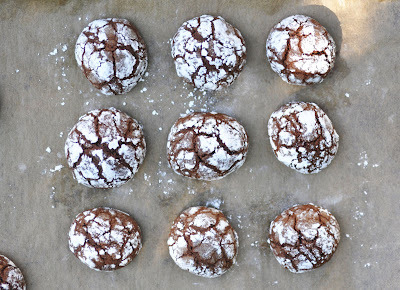 These chocolate crinkles have been on my list for a very long time. I love their rustic look. They look a bit like German breads, perhaps that's why I feel so attracted by them. The ingredients list is simple and straightforward: chocolate, butter, eggs and flour with a hint of cinnamon guarantee a simple and delicious cookie. Tomorrow morning I run my first Half Marathon of the season. The finishing time will be a good barometer of how well I did with the training for the full marathon. I am feeling good and confident. For the first time ever, I have a pacing strategy, that the running coach on that seminar suggested: Get the average pace of your goal time. Run the first third a little slower. Run the second third at average pace. Run the last third as fast as you can/want. He promised PBs with this tactic. We'll see. Wish me luck!! Melt the chocolate and butter together in a double boiler. Remove from heat once melted. Beat sugar and egg until fluffy. Stir in the chocolate mixture. Set aside. In a medium bowl, sift together the flour, salt, cinnamon and baking powder. Add the flour mix to the chocolate mix. Cover and refrigerate for at least 1 hour, so that the batter is firm enough to shape into balls. Preheat oven to 165C/325F. Line baking sheet with parchment paper. Fill a shallow bowl with powdered sugar. Form balls size of a walnut. Then roll the dough balls in the powdered sugar until they are completely coated. Place the balls on the baking sheet about 1 and 1/2 inches apart. Bake for about 10 minutes, or until the edges are firm but the centers are still soft. Cool on wire rack.